Today I am going to share my Bath & Body Works haul.I had recently visited the Bath & Body Works store and I must say as usual all the products in the store looked very beautiful and amazing. The products from the Sweet Pea and Pink Chiffon ranges from the Bath & Body Works are my all time favorites. So,let's starts with the haul...shall we? "America's Favourite for Body,Hand & Home! Whether you're shopping for fragrant body care or a 3-wick candle, we have hundreds of quality products perfect for treating yourself or someone else." "From Paris, with love! 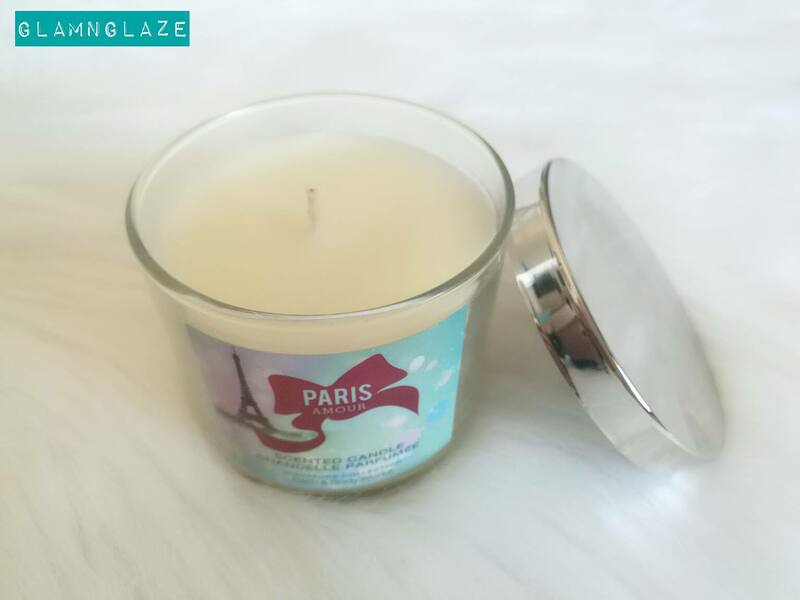 Like a romantic stroll through the City of Love, Paris Amour is a dreamy blend of French tulips with a pop of pink champagne"
This is the first product that I picked.The beautiful fuschia-pink theme caught my attention instantly. The shower gel is nice and smells amazing.It contains shea-butter & Vitamin-E.These ingredients are famous for keeping the skin hydrated and smooth. The shower-gel is cool and lathers-up easily and cleanses the skin nicely. Did'nt experience any dryness.The bottle is very cute and travel-friendly! "Wash your way to softer, cleaner skin with a rich, bubbly lather bursting with fragrance. Moisturizing Aloe Vera and Vitamin E combine with skin-loving Shea Butter in our most irresistible, beautifully fragranced formula!" The next product is a body-lotion from the Paris Amour range. This body-lotion is amazingly creamy & smooth in texture.It has a running-consistency and gets absorbed into the skin quickly leaving the skin soft!I love the fragrance of the body lotion and it has a very floral-fragrance(tulips). "America's #1 Body Lotion! Infused with Shea Butter and our exclusive Daily Moisture Complex, our enhanced lotion contains more of what skin loves, leaving it feeling incredibly soft, smooth and nourished. Fortified with nutrient-rich ingredients like protective Vitamin E and conditioning Vitamin B5, our fast-absorbing, non-greasy formula delivers 16 hours of continuous moisture." Oh My God! I'm in love with this body mist.The body-mist works effectively when we use it in combination with the shower-gel and the body-lotion.The body-mist has a very pleasant(floral) fragrance that soothes the senses and the longevity of the body mist is about 4hrs when used on its own. "Lavishly splash or lightly spritz your favorite fragrance, either way you'll fall in love at first mist! Our carefully crafted bottle and sophisticated pump delivers great coverage while conditioning aloe mist nourishes skin for the lightest, most refreshing way to fragrance!" Fourth product is a hand-soap from the Paris Amour range! A hand-wash is used everyday and a daily-necessity and I wanted to try this perfumed hand-wash. I am yet to try this one out.Gotta check if it keeps dirt at bay. Shall keep you posted.But,nonetheless it smells awesome had checked out the tester. "This powerful germ-killing hand soap is enriched with an exclusive moisturizing blend to help hydrate and soften skin as powerful ingredients leave dirty hands clean and lightly scented with French tulips, apple blossoms and sparkling pink champagne. An exclusive blend of moisturizing honey, coconut milk and olive fruit extracts helps to nourish and soften skin Exfoliating microspheres and cleansing bamboo extract leave hands deeply cleansed and feeling smooth and soft Lightly scented with French Tulips, Apple Blossoms and Pink Champagne"
Last but not the least is a beautiful single-wick scented-candle from the range.It's from the Signature Collection.The packaging looks lovely and feminine...beautiful! I sniffed this scented-candle and felt really amazed.It also, has the same fragrance just like all the products from this range...seriously awesome.Expecting rosy aromatic-effect once used...let's see.Will keep you posted. Update : It's an okish product.You might choose to skip it! The packaging of these products is travel-friendly which is a very important factor when you are planning to carry them along anywhere. 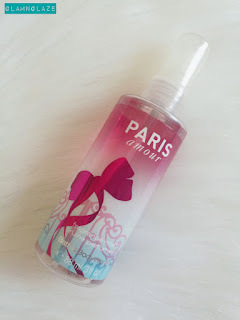 Overall,I am liking the Paris Amour range from the Bath & Body Works. Have you tried any product from this range? What's your favourite range from the Bath & Body Works?